Telemann (1681-1767) was one of musics great mavericks, an aesthete with a restless mind and cosmopolitan tastes. During his nearly seven-decade career, he sampled every conceivable genre, idiom, and national style, and incorporated a dizzying number of them into his music. 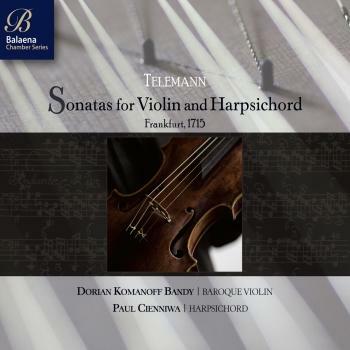 The Violin Sonatas of 1715 are so wide-ranging in both idiom and expression that, heard together, they constitute a microcosm of Telemanns art. Other recordings of these works often include cello. These pieces, however, were written specifically for the duo instruments just violin and harpsichord, performed brilliantly here by and Dorian Komanoff Bandy, violin and Paul Cienniwa, harpsichord. In making this unique recording, Bandy and Cienniwa didnt think of them as six individual pieces, but a single big piece with 24 movements. The Sonata in F sharp minor is a real rarity and this is its world premiere recording. Unpublished in his lifetime, the manuscript is signed as George Melante, a nearly-anagrammatic pseudonym. Comparing the seven works on this recording, it is clear that Telemann had no simple schema, no formula that would produce a single piece of music over and over. These are seven truly distinct sonatas: each unique, daring, and extraordinary in its own way.